Not everyone is born a leader, but everyone can learn different skills to help them thrive in a leadership position. Being a good leader is more than just giving direction, you need people to trust you, feel as though you have their best interest in mind, you need to be able to communicate ideas, and motivate a team. 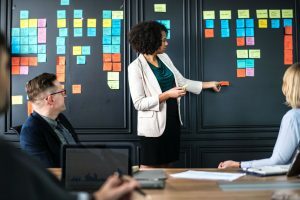 Whether you have found yourself in a new leadership position or you simply want to improve your leadership skills for a future career, there are different courses you can take to do this. Even if you do not picture yourself in a leadership position down the road, learning these skills will be beneficial in many aspects of life — from leading a project to being a parent. Whatever your reason may be, you can improve your leadership skills with the help of ProMethIt. At ProMethIt, we offer different professional training programs that can enhance your business skills and help you become successful in your career. One of our courses focuses on communication, which is one of the most important leadership skills to have. But what are other important leadership skills to have? There is no one answer and skills can be broken down into soft and hard skills. In this blog, we are going to take a look at some of the most important skills that every great leader should have. We have already mentioned that every leader should have great communication skills, but we wanted to take a closer look at what this means and why it is important. As a leader, you are communicating with a lot of different people, from your team to your boss to your clients. This means that you need to be effective when you communicate. There are many different aspects that go into being a good communicator. You have to be able to interact face-to-face, over email, on the phone, in large groups, in one-on-one meetings, the list goes on and on. But communicating is not just getting your message across effectively, it is also being able to listen. Listen to your staff and what your team is saying can not only help you improve your business but can also help you build a better relationship with your team. Being an effective communicator and learning the different aspects that make you effective can help you in your leadership role. Our course can help you learn the important communication skills you need in your career! When it comes to being trustworthy, it can be a difficult skill to learn. How do you teach someone to be trustworthy? If you already consider yourself trustworthy, you can learn how to better show your team that. By being open and vulnerable around your employees, you will be able to show them that they can trust you. Showing your team that your trust them, their ideas, and the work that they do can help you gain more trust in return. So, why is being trustworthy important? When your team or employees trust you, they will be more likely to come to you with concerns, questions, and problems they may have. This will give you the ability to help and make a difference in your company and build a mutual respect between you and your employees. 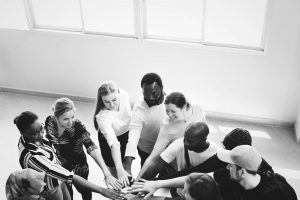 When your employees or team see you are a trustworthy leader, you will be able to help solve problems and gain their respect, which is why this is an important leadership skill to have. As a leader, you will run into many different problems and have to come up with solutions. Being able to do this effectively can help ensure that your business or team runs smoothly. You will face problems among your team or employees, as well as problems related to clients. Being able to think logically and come up with different solutions in a calm manner are skills every good leader should have. 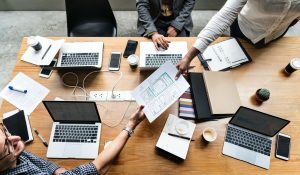 Being able to quickly and efficiently come up with solutions while keeping the best interest of your business and the employees in mind is important. When you have these skills and are able to come up with successful solutions, you will motivate your team and keep them inspired. A good delegator trusts their employees or team to handle different tasks and get the job done right. A leader needs to be able to identify the different skills that the team has to offer and use those skills to help with different tasks. Many leaders feel that they cannot pass projects on to their team, but that is the sign of being a good leader. You show trust for your team and show that you notice their different skill sets. As a leader, you need to learn how to pass tasks on to your employees and learn to let go of control. Let them handle the task and don’t jump in half-way through to get it done your way. This will destroy your team’s motivation and show a lack of trust. As a good delegator, you will be able to accept feedback from employees, assess and understand your employees’ strengths, work as a team, trust your employees, set expectations, and more. As a leader, one of the most important skills you can have is being able to motivate your employees. You are the person who can push your team to do better every month and to continue to work hard to produce the best work. While getting paid is another motivator, that will only do so much good. Being able to motivate your team can help you keep your business thriving and always improving. You can motivate your employees by recognizing their work, giving them rewarding responsibilities, setting effective goals, and showing your employees that you appreciate all the work they are doing. When your employees feel underappreciated, they will likely be less motivated to work hard. The last leadership skill that you should have is positivity. Being able to find the positive in every situation can help keep your team motivated and working hard. Create a positive work environment to help reduce stress throughout your business. Show that you care about your employees and encourage them to keep their heads up. When you are a positive and empathetic leader, your team will be more likely to want to work with you and for you. Be friendly, show you care, make jokes, learn to laugh at yourself, and use positive reinforcement to keep your business positive and thriving! These are a few of the many skills that leaders should have. We find these ones to be some of the most important, but many skills are needed to become an effective leader. 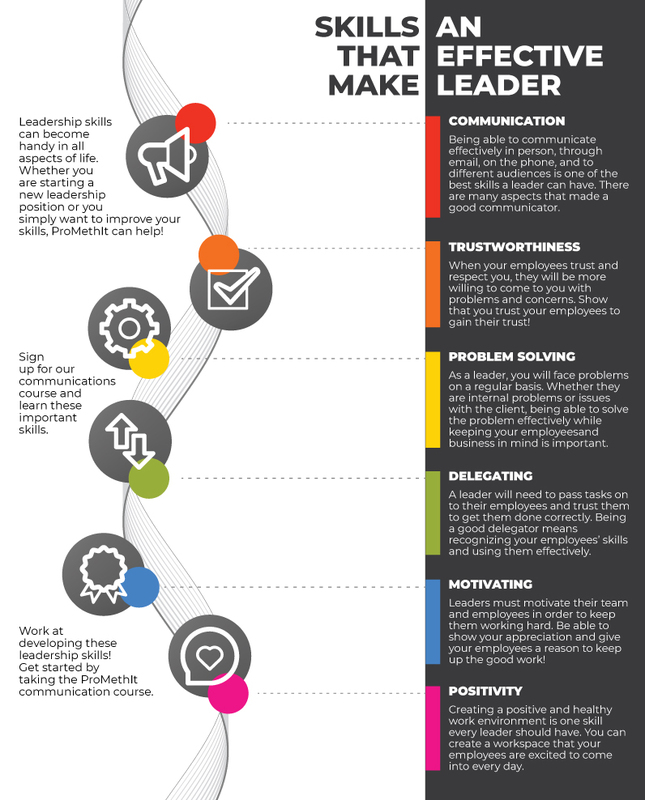 If you want to improve your leadership skills, start by taking the ProMethIt communication course! We will teach you how to communicate effectively and become a better leader. Contact us today to learn more!